Even amongst Bennington’s high-performance luxury pontoon boats, the 2018 QX Series stands tall as a best-in-class boating machine. The 2018 series brings a new level of style and attention to detail to the timeless QX design. At first glance, the QX Series pontoon boat is a jaw-dropper with more than 20,000 color options and the ability to create something that is completely unique to you. The sleek lines of the hull, with stainless steel accents put an emphasis on style and craftsmanship. With more than a dozen floor plans, and thousands of color and feature combinations, the Bennington QX Series is a certified head-turner. 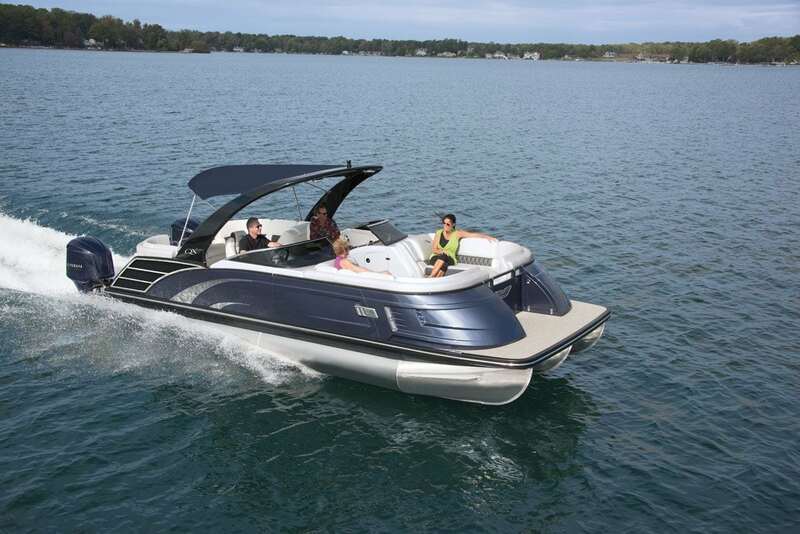 The Bennington QX Series is available in three main floor plan styles: the Swingback, the Fastback, and the Stern Lounge. The Swingback showcases a rearward-facing stern lounge that easily transitions to a forward-facing seating setup. Choose from thirteen different mood-lighting options with perfectly placed RGB accent lighting. Rear facing Kicker speakers provide audio entertainment both on and off the boat for that ideal summer soundtrack. The QX Swingback comes upholstered in Glacier White Simtex vinyl accented with Carbon hand-stitched diamond quilt. The Fastback can be customized with several furniture and feature combinations, including a luxurious stainless-steel Covina wheel trimmed with leather, Tuscan Dune Simtex vinyl accented with Espresso hand-stitched diamond quilt seating, and RGB illuminated cup holders and speakers. The Stern Lounge is all party in the back with a smoke tinted walk-thru windshield, cladded sport arch with illuminated Wet Sounds speakers, and exterior bow speakers. The dual console command center adds additional performance and luxury on this stylish pontoon; the co-captain console includes a counter top, bar sink and Kicker stereo port side. From top to bottom, the QX Series by Bennington Pontoon Boats is one of the most customizable boats on the market, and with Bennington’s industry-leading craftsmanship and manufacturer’s warranty, you’ll be making memories for years to come. Discover what makes the Bennington QX Series one of the most-popular luxury pontoons on the market and start building your dream pontoon boat today. Using our online design center, you can hand select each and every feature for the perfect boating experience. Bennington Pontoon Boats has been crafting the industry’s leading high-performance, luxury pontoon boats since 1997.